This is something you may have noticed on your grandmother skin: during aging, the ability of the skin to self-repair diminishes. What you might not know, is that a key hormone in reproduction - estrogen (17β-estradiol) - is also important for wound healing: in fact, there is strong association between menopause and reduced wound healing capabilities, whereas estrogen treatment favors healing. Likely, this mechanism of tissue regeneration involves estrogen receptors, as demonstrated in estrogen receptor knockout mice. However, the skin is a complex tissue and it is less clear which cell types are responding to estrogenic stimuli and contribute to wound repair. In a new paper, we helped our Manchester collaborators Matthew Hardman and Elaine Emmerson to demonstrate that keratonocyte cells are a major estrogen targets during wound healing. Mol Cell Endocrinol. 2013 Aug 15;375(1-2):149-56. doi: 10.1016/j.mce.2013.05.015. Estrogen receptor-mediated signalling in female mice is locally activated in response to wounding. Emmerson E, Rando G, Meda C, Campbell L, Maggi A, Hardman MJ. The Healing Foundation Centre, Faculty of Life Sciences, The University of Manchester, AV Hill Building, Oxford Road, Manchester M13 9PT, UK. Estrogen deprivation is associated with delayed healing, while Hormone Replacement Therapy (HRT) accelerates acute wound healing and protects against development of chronic wounds. Estrogen exerts its effects on healing via numerous cell types by signalling through the receptors ERα and ERβ, which bind to the Estrogen Responsive Element (ERE) and initiate gene transcription. The ERE-luciferase transgenic mouse model has been influential in assessing real-time in vivo estrogen receptor activation across a range of tissues and pathologies. Using this model we demonstrate novel temporally regulated peri-wound activation of estrogen signalling in female mice. Using histological methods we reveal that this signal is specifically localised to keratinocytes of the neoepidermis and wound margin dermal cells. Moreover using pharmacological agonists we reveal that ERβ induces ERE-mediated signal in both epidermal and dermal cells while ERα induces ERE-mediated signal in dermal cells alone. Collectively these novel data demonstrate rapid and regional activation of estrogen signalling in wounded skin. A more complete understanding of local hormonal signalling during repair is essential for the focussed development of new therapies for wound healing. I participated in this project few years ago, as a fellow in the laboratory of Adriana Maggi in Milan. 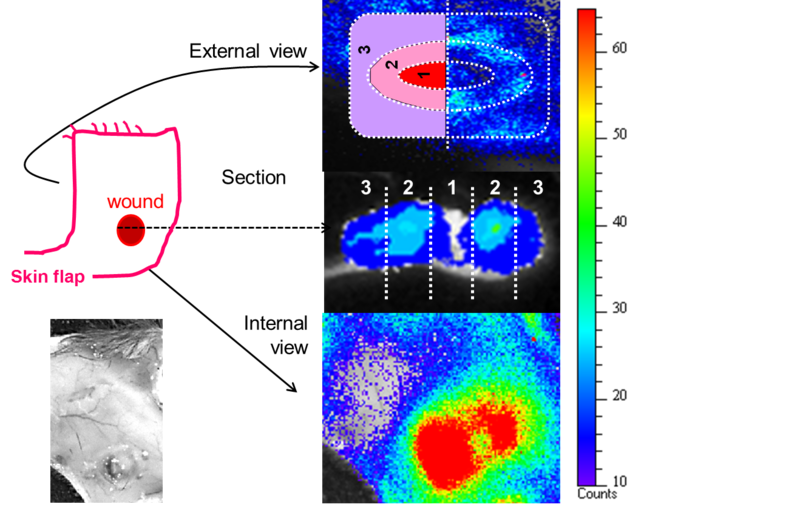 I mainly focused on bioluminescence imaging of periwounded skin of ovarectomized repTOP ERE-Luc transgenic mice using CCD cameras from Berthold Technologies (NightOwl) and from CaliperLS (Xenogen IVIS Lumina). In the picture, the higher bioluminescence intensity (red-yellow pseudocolor) reflects the status of estrogen receptor activation via expression of the target gene ERE-Luciferase, which is a light-emitter. This is the same model that allowed me to observe a link between dietary amino-acids and fertility, the discovery that prompted me to move in Switzerland to have a better grip on energy metabolism. I'm happy this paper is finally out, congratulations Elaine.